Cali is such a little cutie and she gets so much attention when we're out and about. Everyone loves our little "Yorkie", but what they don't know is that she's a mix breed. Cali was 1 of 5 in her litter and she was the only one with Yorkie coloring. Her siblings were all white like their mom. She doesn't have a silky coat like a Yorkie, nor does she have a curly coat like a Bichon. It's almost like Cali has real hair with many, many different colors in it. Her body is really long. As are her legs, tail, ears and snout. She doesn't have a Yorkie's body, but she is small... about 8 lbs. 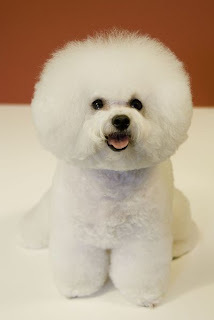 She has the face of a Bichon and looks exactly like the one above, minus the extra poofy face. It's amazing how everyone thinks she's a Yorkie, but if you really look at her, you can tell that there's no way she's a full-bread Yorkie. She has the craziest of personalities and is the best cuddler. She hops like a Bichon and is over-protective like a Yorkie. Cali's a social butterfly, but is caucious with who she'll socialize with. We love her mixed look and mixed personality to pieces. Today my fur-baby girl turns 1! I'm in love with your little pup!! 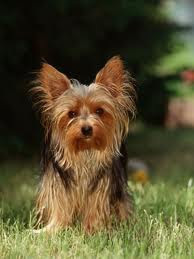 I've always wanted a yorkie...and want to name him after my favorite football player (Tedy Bruschi...hehe). One of these days it is going to happen. But they get along with other dogs well, right? Aaaw Happy Birthday to Cali!!! My parents have a Maltipoo, Yorkipoo, and Papitese....they are obsessed. AWwww doesn't time fly by waaaay to quick? Happy Birthday Cali!! Happy Birthday to my special little granddog! Any special plans to celebrate? Now is Cali's name like Cali short for California? or is it like Kallie or Callie? just curious! Adorable!! Happy birthday to Cali!! Happy Birthday, Cali! She is too cute! My little Avery is a Bichon. I can definitely see the resemblance in her face. They have such funny personalities! That's so cute- I just asked a question on another post of yours about her and found this one! I love your lil Cali and think she is precious! :) Awh, we have a full bred adopted chihuahua- Booger and I love my lil guy to pieces! !